Lyricism is the backbone of hip hop. Although there are a ton of rappers who aren’t saying a gotdamn thing, there are those who are exceptionally gifted at putting words together over a beat. And with so many songs dropping during any given month, we feel that those rhymes that combine lyrical dexterity and cleverness with verbal gymnastics should be celebrated. Each month, we’ll spotlight five of the finest offerings and leave it up to you to vote who had the “2Dope Verse Of The Month.” After we tally the votes, we’ll post the winner of the fan vote as well as who The DopeHouse thought put together an excellent display of lyricism. When Andre 3000 makes an appearance, it is common knowledge that we are being blessed by one of the best to ever do it. So when the always elusive Andre Benjamin showed up again in collaboration with Frank Ocean after the show he put on with “Pink Matter” off of Ocean’s channel ORANGE, it was expected that the ATLien would shine. We just didn’t know what form he’d shine in. Of course, our collective eyebrows were raised when Three Stacks sent what many considered to be a not-so-subtle jab at Drake and anyone who doesn’t write their own rhymes with the last few bars. However, as Cee-Lo explained (9:39), the verse was two years old and wasn’t a shot at Drake. It was just a gut punch to sucker emcees who act like they write rhymes, but don’t. So there’s that. 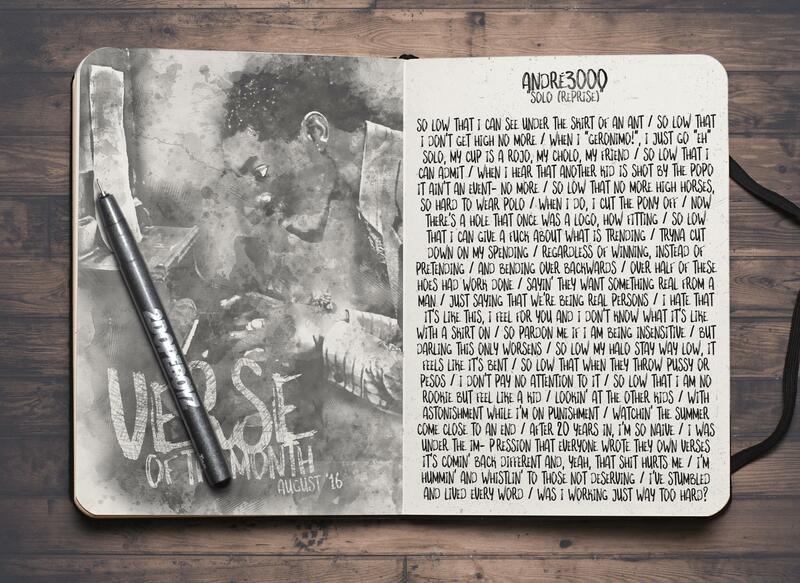 But, as a whole, 3000 simply obliterated his verse. From the scatting flow to the content within it, 1/2 of arguably the greatest hip hop group of all-time wrung every drop out of Ocean’s “Solo (Reprise)”. It was political (“So low that I can admit/when I hear another kid is shot by the popo/it ain’t an event no more”), an indictment on a culture of materialism, introspective and, ultimately, the 2DopeVerse of the month in a landslide.